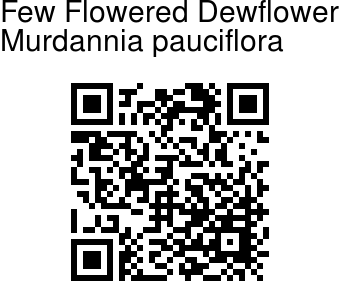 Few Flowered Dewflower is a prostrate spreading herb, rooting at lower nodes. Leaves are 2-3 x 1-1.5 cm, ovate-lanceshaped, base rounded or heart-shaped, tip pointed, sheath about 5 mm long, hairy. Flowers are brownish-yellow, 1-4 in axillary and terminal cymes, 4-5 mm across. Flower-stalks are up to 1 cm long, usually deflexed in fruits. Sepals are 3, about 3 mm long, oblong, acute. 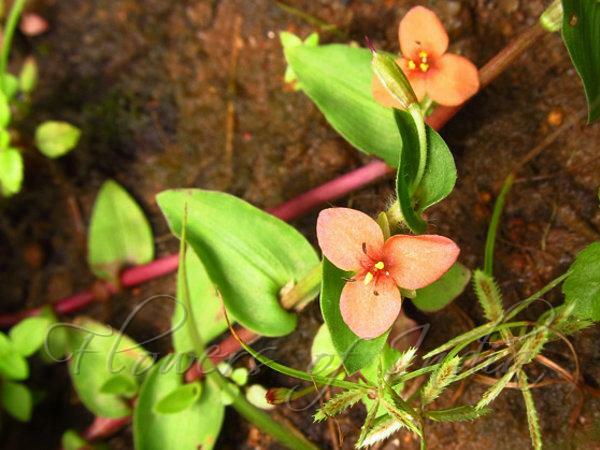 Petals are brownish-yellow, oblong, pointed. Fertile stamens 3, filaments glabrous; staminodes 3. Capsule 4-5 mm long, oblong-fusiform, subtrigonous, acute. Seeds 4-6 in each cell, 1-seriate, black, sparsely pitted. In India it is found in Karnataka, Kerala, Maharashtra and Tamil Nadu. Flowering: September-November. Photographed in South Wynad, Kerala.